The end of the year ended 3 weeks ago and I have yet to give a summary of my 2015 holdings. This summary will be from my records on 1/1/2016. There has been a correction lately in the last 3 weeks of ~10% so the portfolio has dipped a bit even after my monthly January contributions. My yield sits a bit below 3% and with this I yield around $4122 a year in dividends. I don't include the cash when calculating yield (yield is calculated out of a the total of equity positions). Overall I have met my goal in 2015 and 2016 will be another year to continue my dividend journey. 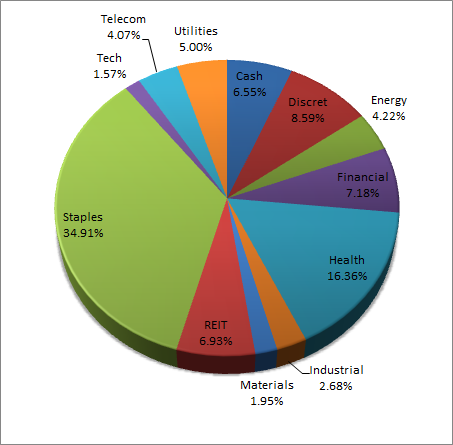 In 2015, I have been able to expand my holdings into other sectors besides consumer staples. Staples still account for a large % of my holdings; however, I have started making work in increasing my Healthcare holdings and Utilities. I plan to make Staples, Healthcare, and Utilities my 3 largest holdings. I have added to Exxon this year but my Energy positions have decreased after selling KMI during the dividend cut. KMI is my first stock with a dividend cut. In a move to quality, I have increased my portfolio holdings in high quality companies. I now primarily seek to add companies with extremely high credit ratings and earnings stability. The table above shows companies with the highest quality that I own at the top. The chart below shows my holdings by size. 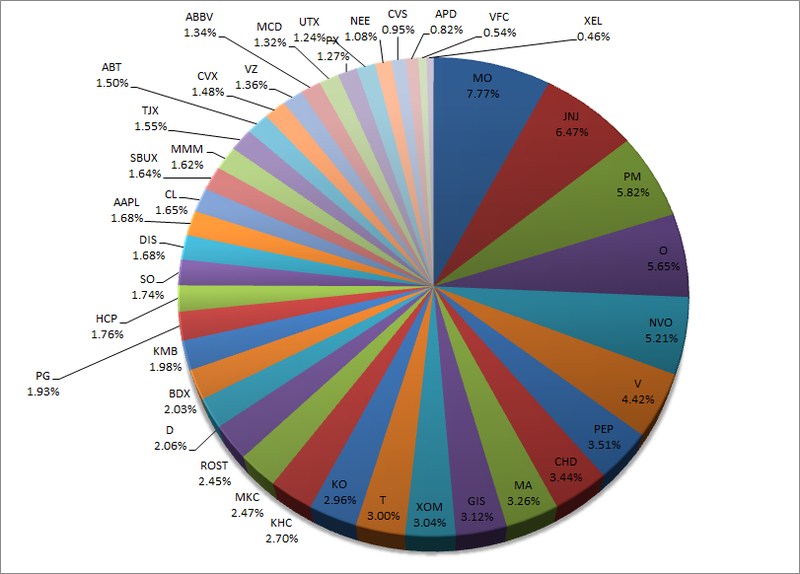 My largest holdings are MO, JNJ, PM, O, and NVO. 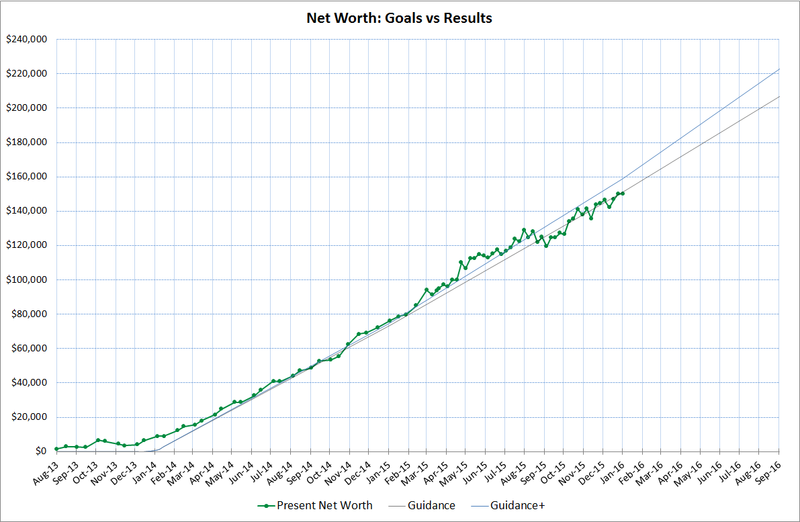 In 2016 my target is to hit around $250k-$280k in net worth. My goals may change as the months progress and my own earnings estimations become more clear. 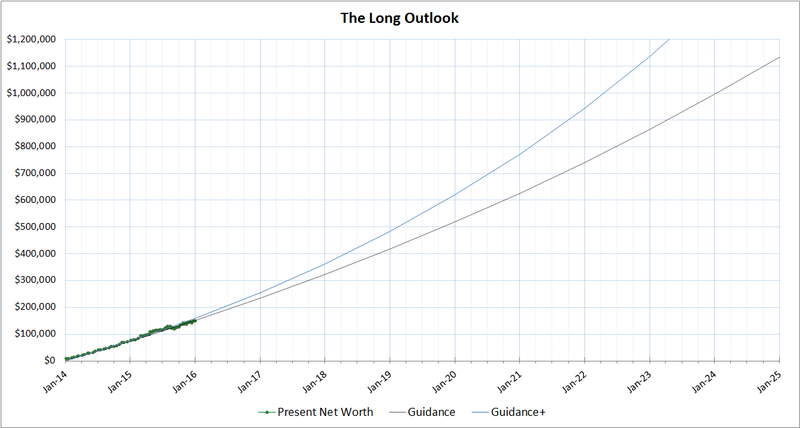 After setting a net worth target, I can then define a annual dividend target since I plan to hit around a 3-3.5% average yield after some cash is put aside for emergency. This goal may be impossible though if the market correction continues to progress further. My goal is income accumulation and the fluctuations in my portfolio are of little concern. My objective is to make sure the income is safe and the large majority of my portfolio are in incredibly stable established corporations. The table below shows the dividend growth rates of all my companies that I hold in 2015. KMI was removed from the list since I sold it, and KMI was the only company that reduced its dividend. CVX has not raised their dividend in 2015 but still keep their aristocrat status. MA 0.1600 0.1600 0.1600 0.1600 45.45% Was 0.11 last year. 2015 was an impressive year in dividend increase. The companies combined on average increased their dividends by 10.25%. The average yield of my portfolio is 3% so the total income growth (just with dividend increases alone) is 13.25%. This was way above my expectations! 2016 will be another exciting year. I look forward to any opportunities that may arise. At the moment I am appreciating the discounts on many high quality dividend aristocrats and plan to pick up many along the way. I'll leave this post with a graph of my progress since my start towards financial freedom until Jan 1, 2016. I have a long way to go before I hit $1,000,000 but one's got to start somewhere! Beautiful charts and excellent results. Thanks for sharing and good luck in 2016! Great charts -- I especially like your long outlook graph... If you keep things going like that, you'll get to financial freedom pretty fast!